BEER FESTIVAL: NCCBW – A Call For Volunteers! We’re just over 3 weeks away from the 2nd annual National Capital Craft Beer Week! They still need volunteers for their signature event, the Craft Beer Festival, held at Marion Dewar Plaza on Friday, August 16 and Saturday, August 17. It’s a great way to help promote our local craft beer community, meet new friends, talk to the brewers and have some fun. Volunteer shifts are generally between 4-8 hours long. Positions include: logistics, sales, security, program assistance and communications. Volunteers receive a festival t-shirts and an invite to the volunteer wrap-up party on Sunday, August 18th. Contact the NCCBW volunteer coordinator to sign up or for additional information. Mike Lackey (left), brewer at Great Lakes Brewery and Mario Bourgeois (right), brewer at Cassel Brewery getting their photo taken with a beer fan (middle). To get a better idea of what the brewers have been collaborating on we interviewed the Ottawa breweries involved in The Brewery Market // Capital Mashup. Check back during the week of June 30 – July 6 for a preview of what's going down July 7 in Parkdale Park. Our fist interview is with Mario Bourgeois, head brewer at Cassel Brewery Company in Casselman, Ontario (40 minutes outside Ottawa). In their first year they've produced 7 brews including their flagship Golden Rails Honey Brown and Railroad Special seasonal, Maple Rye. Recently the nanobrewery won a $55,000 grant from Prescott-Russell Community Development Corporation (PRCDC) through the Eastern Ontario Development Program to help expand their business. For the Capital Mashup, Mario was teamed up with Mike Lackey, brewer at Great Lakes Brewery. Ottawa Beer Events (OBE): Can you tell us about the collaboration beer? Mario Bourgeois (MB): We did a Cranberry Saison, 30gal of it on a pilot system. Did you get to pick how you collaborated with? How did you get paired up with Great Lakes Brewery? No, Great Lakes Brewery (GLB) was offered to us, being a big fan of the 666 IPA I didn't hesitate a second! Was a very fun and pleasant experience to create a beer with another brew master; share stories, experiences and, of course, a few laughs! 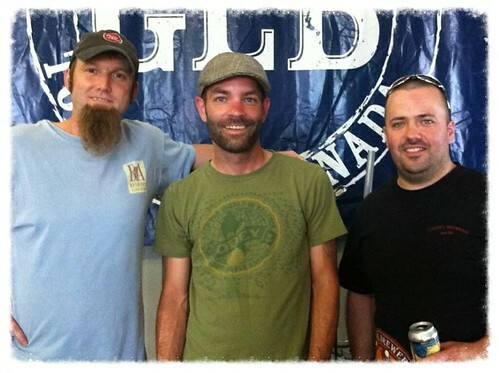 Mike Lackey is from a similar background as me – we learned brewing on the fly. I was also inspired by the amount of pilot batches Mike is doing, I will start to do the same to have a few more recipes in the pipeline. We'll have our Golden Rails Honey Brown, Hopper Car IPA and also our White Fog Witbier. The Ottawa Brewery Market // Capital Mashup will be held on July 7, 2013 at Parkdale Park (12pm – 8pm). Admission is free and families/pets are welcome. The event will be held rain or shine – prepare yourself for the Ottawa weather.